The new play from celebrated playwright Herman Frogspawn has premiered to fierce criticisms about its depiction of nineteenth century medicine. Readers can judge for themselves whether such opinions are justified, as the author has kindly allowed us to reproduce an excerpt from this dark Victorian melodrama here. The scene is the drawing room of the Duchess of Caerphilly. Her niece, after choking on a grapefruit, falls down in a faint and neither the footman nor the boot boy can revive her. Luckily, professional help is on hand. Good lord! Help! Help! Somebody do something. Stand aside please. I am a doctor. Please, give me some space here. DR GRUMBOLD KNEELS BY THE PROSTRATE FORM OF MISS PHILLIPS AND BEGINS TO LOOSEN HER UNDERGARMENTS. Whatever is the matter with my ward? This man has fallen down, your ladyship. But this man is a woman. Yes, yes, I know. I'm a doctor. That was one of the first things they taught us. Being a doctor? I should say so. The training lasts a whole week and they make us read a book. No - this 'falling over'. Is that serious? Oh yes, your ladyship. Very serious indeed. Luckily I am well acquainted with the condition. I have treated people who have fallen over before. You there! Yes, you sir. Don't just stand there like a blithering idiot. Go and fetch some gin at once. THE FOOTMAN DEPARTS. DR GRUMBOLD PROCEEDS TO LOOSEN HIS OWN UNDERGARMENTS. Can she be revived? Only we have somebody coming to clean the carpets this afternoon. Never fear, your ladyship. I have to tell you, this is one of the most severe cases of falling over that I've seen, but I'm confident that with care, patience and gin she can be revived. Oh, where is that fellow with the gin? THE FOOTMAN RETURNS HASTILY, CARRYING A SMALL BOTTLE OF GIN. Here sir. Will this do, sir? DR GRUMBOLD TAKES A SWIG FROM THE BOTTLE. Well, it's not medical gin but it will have to serve. I only hope that this young lady is not gin intolerant. Is there anything I can do sir? Yes, yes, more gin I say! This young lady is in a critical condition. Without a steady supply of gin we could lose her. Well, what are you standing there for? Go! Go, I say! I say, doctor - should she be that colour? What colour is she normally? More sort of pink. Less sort of blue. Then this is more serious than I thought. Oh, where is that blasted boy with the gin? THE BOOT BOY RETURNS WITH FOUR LARGE BOTTLES OF GIN. ...this woman is at death's door. She needs a constant supply of gin. Sorry be damned. Go and get more gin! Everything depends on getting as much gin into her as quickly as possible. It's touch and go. Good, well if you've got everything under control, I'll just sit here and get on with my needlework. THE BOOT BOY RETURNS WITH MORE BOTTLES. Gin's all gone, sir. We've got a two bottles of brandy and half a jug of cider. Intolerable! Are you trying to kill this woman? We must have more gin! Your ladyship, I think we're losing her. Good, good. You carry on. Yes, you sir. 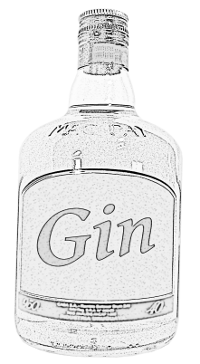 Do you have a gin-pump? I believe that we have such a device in the cellar. It hasn't been used for years, but we might be able to get it going. Then what are we waiting for? Let us fetch it with all haste! DR GRUMBOLD, THE FOOTMAN AND THE BOOT BOY DEPART. THE DUCHESS CONTINUES WITH HER NEEDLEWORK FOR A WHILE BEFORE GLANCING DOWN AT THE STIFF AND MOTIONLESS FORM OF MISS PHILLIPS. I saw that Mrs Thompson in the chemist again yesterday. MISS PHILLIPS CONTINUES TO REMAIN IMMOBILE ON THE CARPET. Murder Up The Gasworks will be running at The Old Abattoir Theatre until the building is demolished next Tuesday. Big hole coming to your town.